As a new owner of a 2013 Jeep Rubicon, I’m just getting back into 4x4ing and off road Jeep adventures. 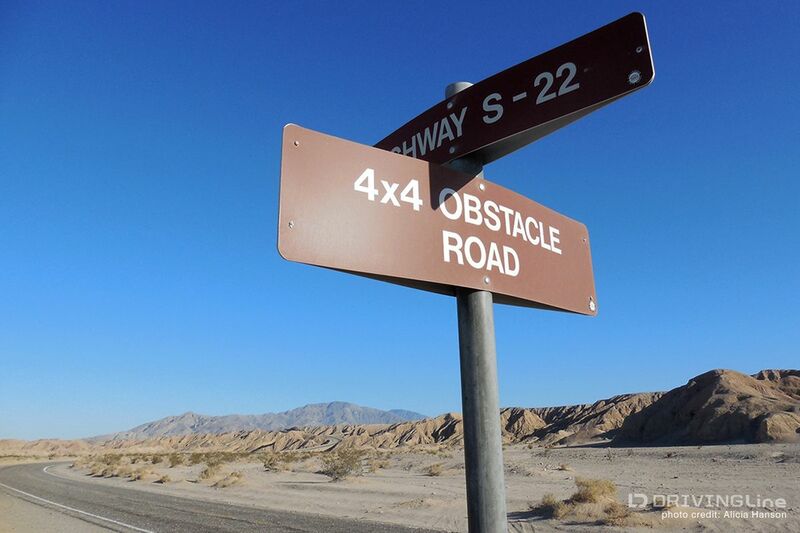 When I stumbled across the 4x4 Training Area during a recent trip to the Anza-Borrego Wilderness, I knew I needed to come back to play and get better acquainted with what off-road abilities my new Jeep is capable of. I’m not completely new to 4x4’s and off-road vehicles – living in Colorado during my 20s, I learned that a four wheel drive was way more functional then the vintage VW’s I started driving on. Now that I call home Southern California home, I love convertibles… but I’d been wanting a 4x4 again. 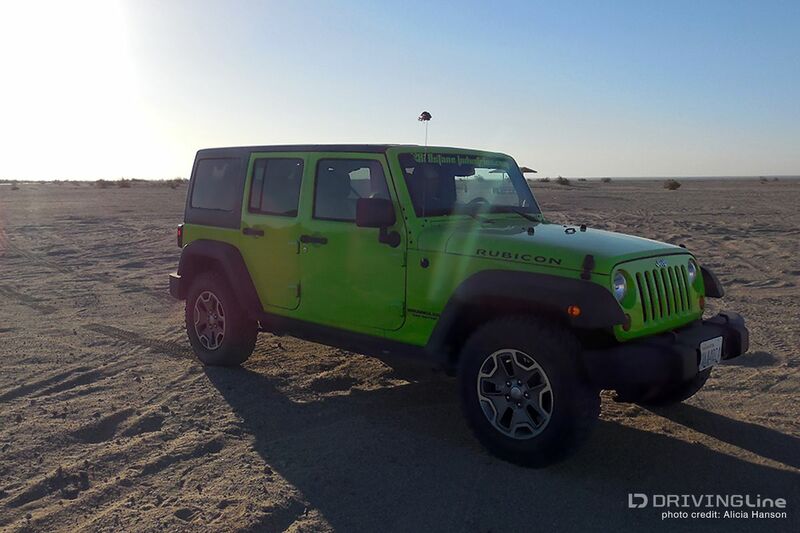 Eyeing a lime green four-door Jeep while passing a dealership, I caved. Returning a few days later for a test drive, I was worried that the Jeep would be gutless and noisy. To my surprise, the new engine had way more horsepower than older models and the Jeep was far quieter and smoother on the highway than I had expected. 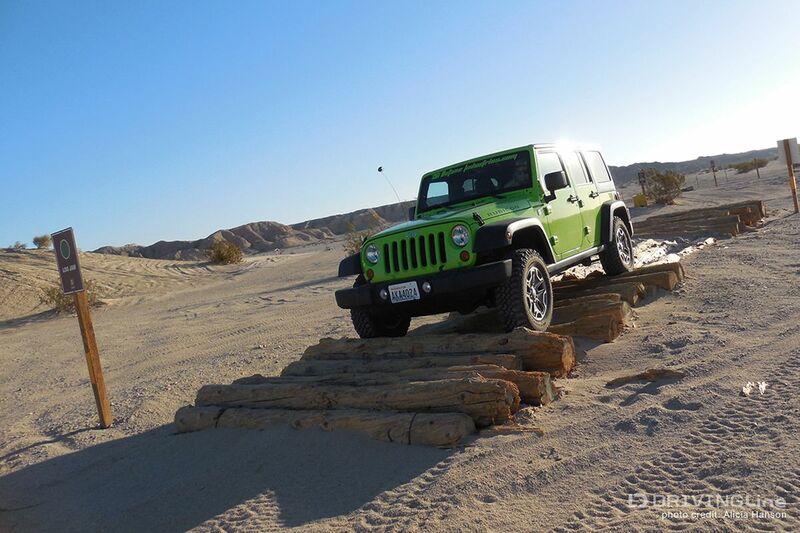 The Jeep seemed to be the perfect combination, and I’ve been loving the ability to cruise out to the desert for 4x4ing and get back home in time to hit the beach in the same day. 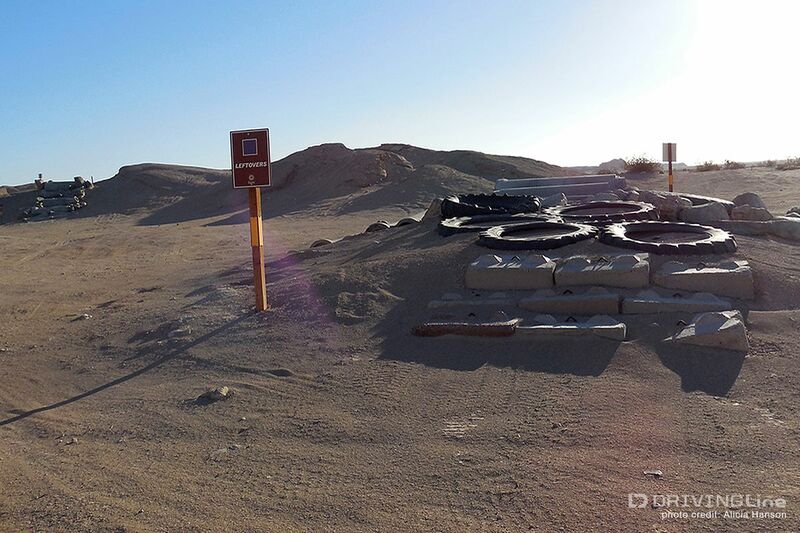 Trying to return to the 4x4 Training Area before the desert heat became too much to bear during the summer, my family and I made it just in the nick of time. 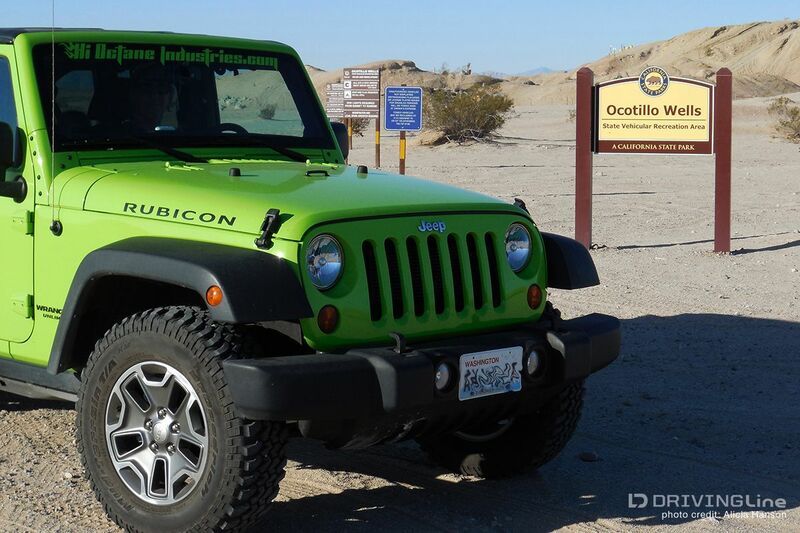 Packing up our Jeep Rubicon, we left the breezy cool coast for the blistering desert – dropping down the mountain into the Borrego Springs area, the outside temperature gauge rose to a balmy 90 degrees…and it was 9:30pm Friday night. Struggling to find the vehicle recreation area in the dark, having only stock headlights and a crescent moon to light our way, we put our GPS to use and were able to pull into Holly Road where it’s located off of. Being mid-June, we were the only campers out there – which meant prime pick of a spot with picnic table and fire pit ring. 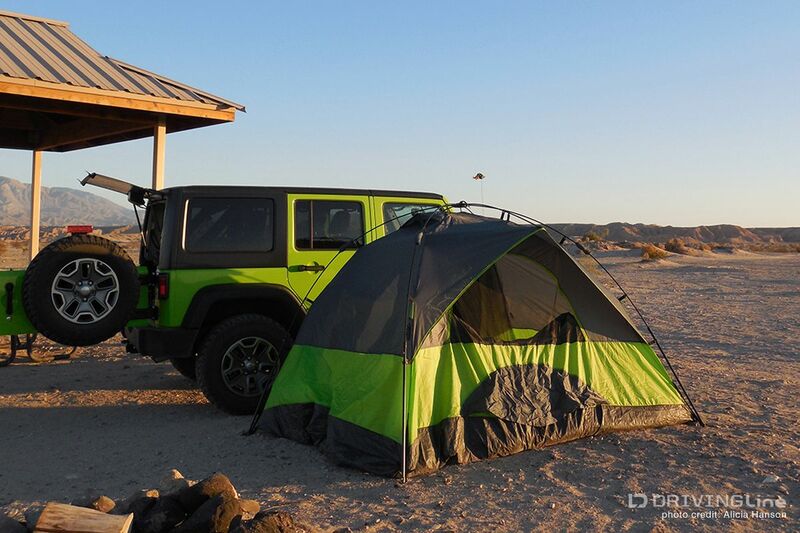 Putting up the tent, we were glad to have a literal “pop-up” tent as the desert winds had kicked up and, even using the Jeep as a windbreak, we had to hustle to load heavy camping goods inside to keep it from blowing away! Waking up at the crack of dawn, the winds had died down and the temperature had cooled a whole 5 degrees, to a manageable 85°F. We decided to skip camp breakfast and instead head straight to the 4x4 area, utilizing the cooler temperatures while we could. Breakfast could wait until after we’d had our fun. 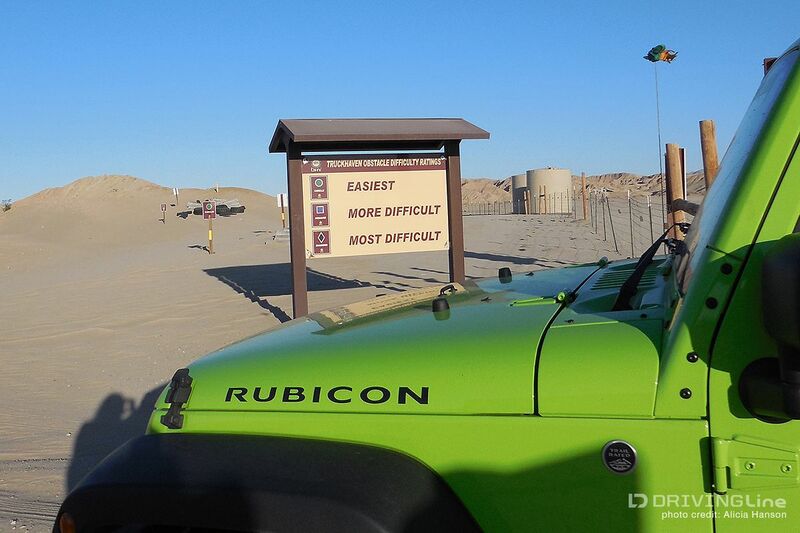 So we headed over to the Training Area and had the whole place to ourselves… As you enter the vehicle recreation area, they post a nice sign explaining the various difficulties of the course. Green circles being the easiest, blue squares as intermediate and black diamond the hardest. We had hoped to bring along some other Jeep Rubicon owners for 4x4 monkeying around, but they all ended up having last-minute conflicts. Since we were alone, and were the only vehicle we knew of for miles, we thought it best to stick to the basics and tackle only green circle obstacles. We didn’t want to get ourselves into something we couldn’t get ourselves out of, and trust me, this place has plenty of those! 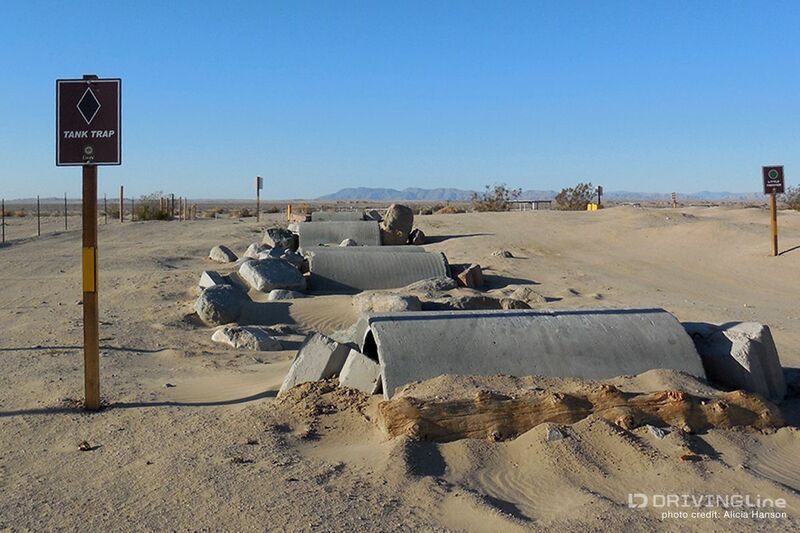 We started with the “Tubular” run - a series of concrete pipes at various heights that you traverse across. Next came the “Little Wup-di-du’s” which is a secession of large moguls to bounce across. Then on to the “Log Jam”, which is similar to the “Tubular” run, but using logs instead of concrete pipes. “Get-er-done Gulch” came up after that, a steep hill to drive up, and over, and all round. Since they were so much fun, we zoomed back over the “Little Wup-di-du’s” a few more times. Being that our Rubicon is stock height, with no lift and moderately-sized tires, we decided against trying the “Leftovers” run. We also skipped the “Tank Trap,”… …“Little Sluese,”… …and a black diamond run called the “Game of Life,” which looks like someone put a lot of work into. 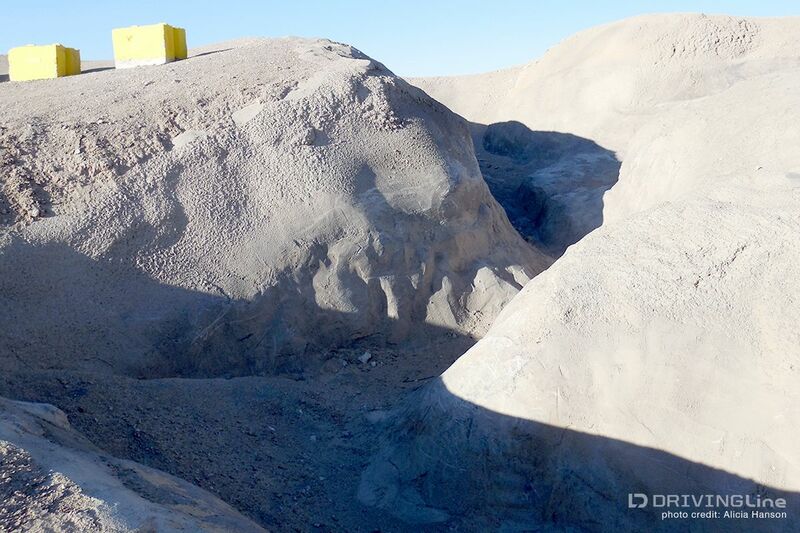 A tight gulch that has been concreted, it resembles an inner tube ride at a waterpark (just without the water of course). 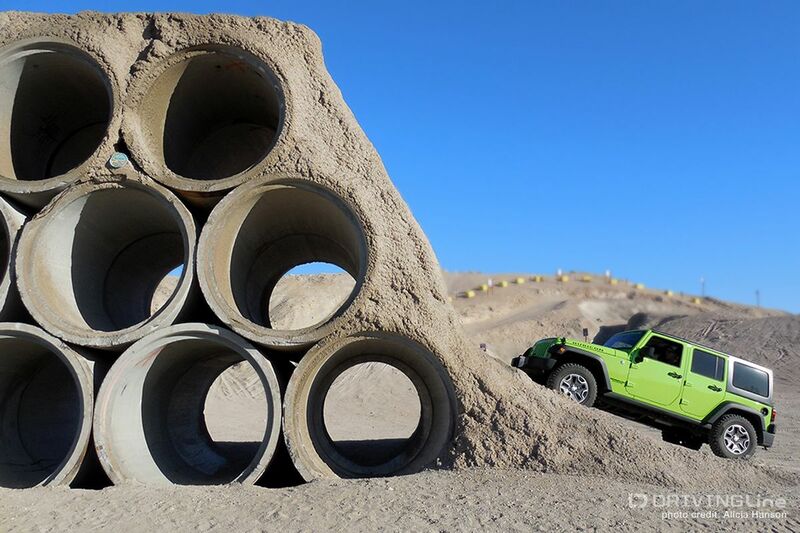 I’d really love to see some 4x4 vehicles tackling the “Game of Life” to see how it could be done. It really doesn’t look feasible to me, but clearly somebody has tried as you can see scrapes and wear marks where people have driven it when looking at it from above. We finished up our morning over at the “Crossover Peak.” Being a black diamond obstacle, we thought we’d just start up it a bit to take a look-see. It’s really quite frightening and I’m sure that feeling would only increase once you got further up the incline! Overall, this was a good adventure, but I think we might have been a little bolder and tried some blue runs if another 4x4 was out with us. 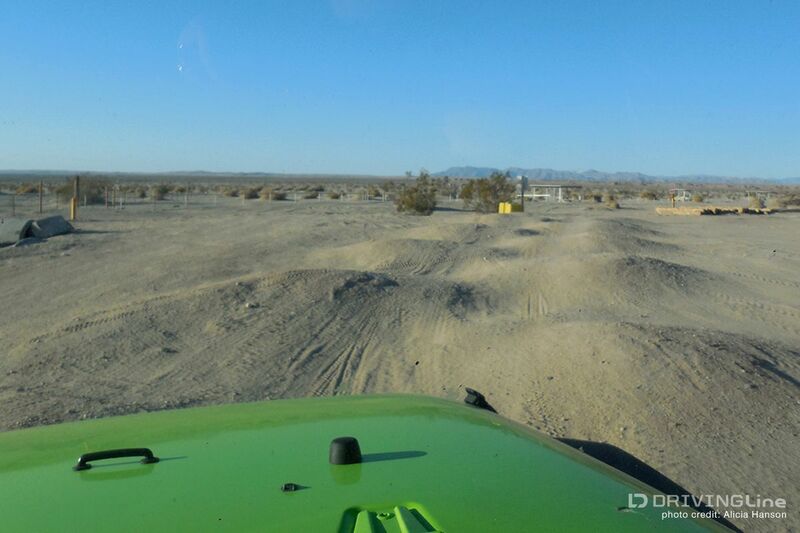 I look forward to visiting the Ocotillo Wells 4x4 Training Area again in the Fall, and bringing some 4x4 buddies with us in order to try more obstacles. 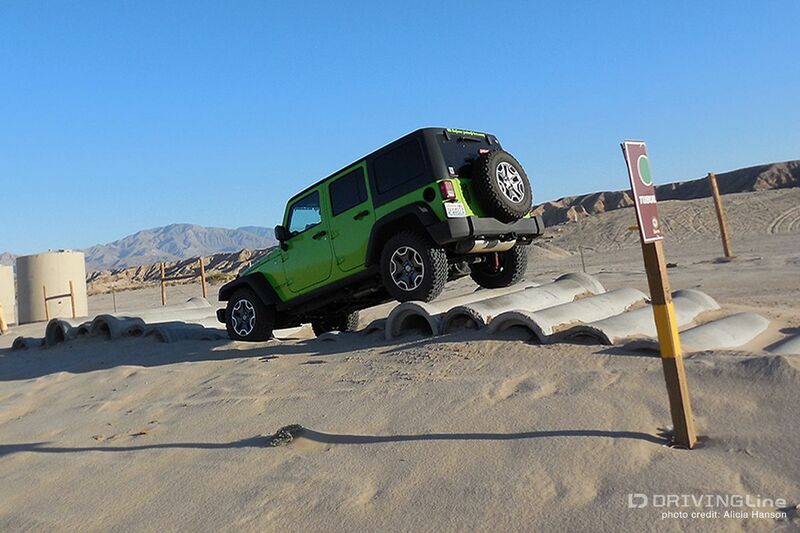 It would also be nice to see a more advanced driver take on the more difficult obstacles. For the rest of the summer, you can find me and my Jeep, with its T-Tops off, enjoying the warm SoCal sunshine and beaches! -Alicia Hanson Want to visit the 4x4 Training Area? 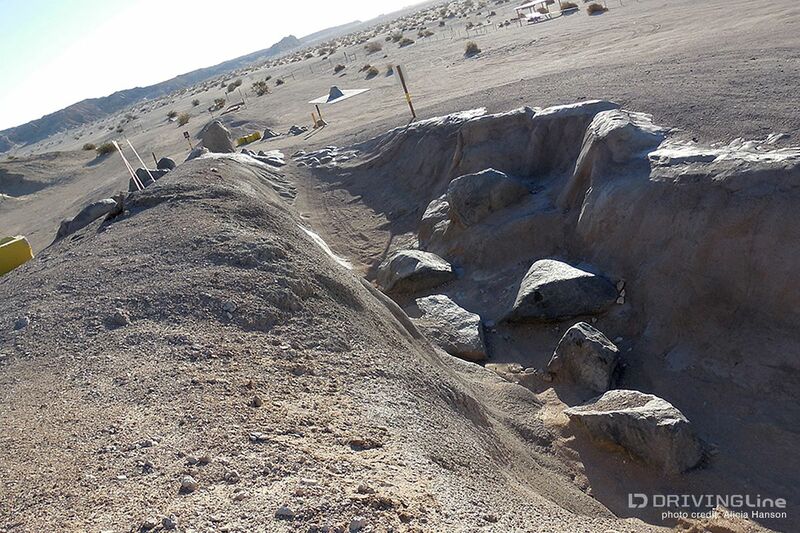 It’s within the State Vehicular Recreation Area of Ocotillo Wells, more info can be found at CA.gov. 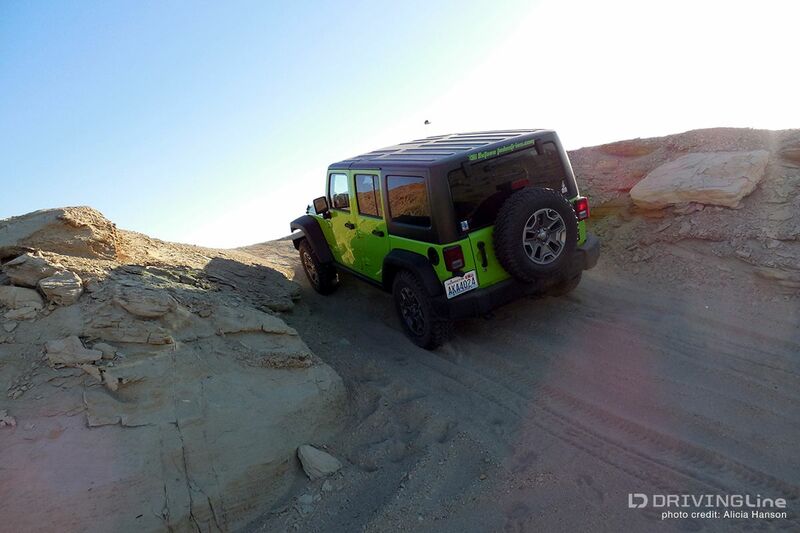 Leave a comment and let us know what your first off-road adventure was like!